Impatiens omiense fronting a composition including: Vancouver hexandra, Podophyllum pleianthum, Aspistra elatior, Dryopteris erythrosora, Hosta ‘Sum and Substance’ and Prosartes hookeri (previously Disporum hokkerig). This is the south bed on the 5th St. side of Portland’s City Hall. This entry was posted in Design, Horticulture, Landscapes, Maintenance, Parks, Plant Choice, Practice, Public Gardens and tagged Portland City Hall Landscapes on April 23, 2016 by gardenriots. R. thayerianum has wonderful glossy narrow leaves with a prominent mid-rib. The leaves stand out in whorls to great effect! A few years ago the Washington Park crew started to joke about their new ‘Himalayan Cloud Forest Garden’ on the north slope of the Park above west Burnside. I was still working in the Downtown Parks and though not part of the project, was greatly excited by its creation. What began as an Ivy removal/ restoration project had quickly morphed into an idea for a species Rhododendron display garden (Or, perhaps, the idea came first!). Washington Park, minus the Zoo/ Arboretum acreage is about 160 acres. Much of the terrain is rough and undeveloped. For years, due to budget constraints, maintenance has been focused on the high use impact areas. Neglected areas included the ‘Cloud Forest’ portion above the ‘Canyon Walk’ which follows the draw down to the old Stearn’s entrance on Burnside where it begins to carve its way through the trees. Over the years English Ivy built up to a smothering blanket. Other plants, like English Holly had reached mature size and were seeding in alarmingly. While on the crew myself, some years earlier, I spent many hours cutting, treating stumps and dragging the Holly trees off. That effort accelerated in recent years when the two staff ‘Rhody-philes’ began feeding off each other’s energy. 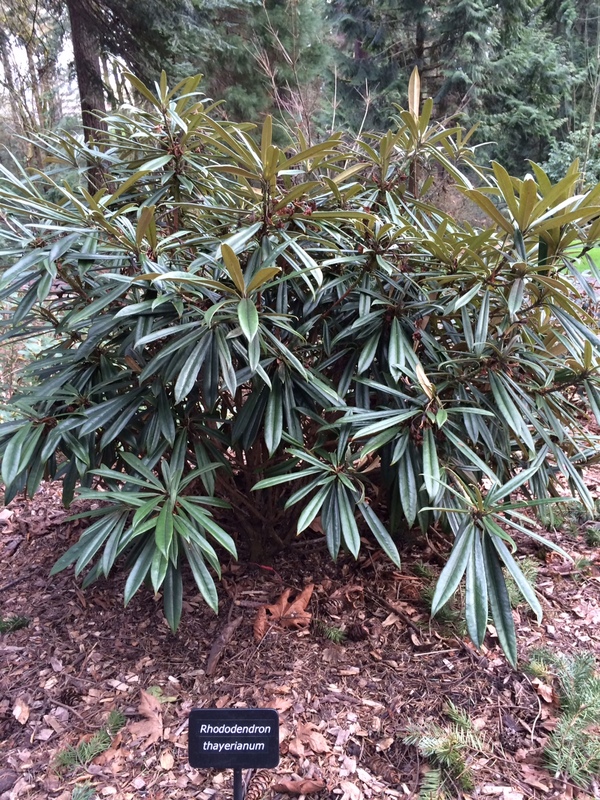 This entry was posted in Parks, Public Gardens and tagged Rhododendron species, Washington Park on February 22, 2015 by gardenriots. My friend Steve has urged me to periodically write about my experiences in the Denial Zone…so here’s a little something: We all know you can only go so far with the whole tropical thing in Portland if you’re not going to invest in a greenhouse. Those of us who try to mimic the tropical look realize that we have to seek out the temperate and a few sub-tropicals that give us that ‘feel’. Bold foliages are key. Architectural plants, and just as important strong foliage contrast. This is not the place for subtlety. Strappy, fuzzy, split and dissected, compound pinnate and palmate, glossy, drip tipped, bold variegation and wild patterns…over the years observant nurseryman and plant hunters have brought us a smorgasbord of unusually foliaged plants. Plant breeders have pushed the limits crossing hardy species in ways that mimic their tropical cousins, I’m thinking Hibiscus here. But still there are certain plants, certain forms and silhouettes, that are hard to replace. Palms are one of these. Many of us grow various palmate forms like genus Trachycarpus, T. fortunei, most commonly, while others have used T. wagnerianus, T. takil and T. princeps. There are many others but of unproven hardiness. Another form of Palm are those with costapalmate fronds, of these I have a Sabal minor doing fine at home slowly getting bigger in the ground for the last four years, (It’s more than ten years old. I’m of the age now where I just say something is ten years old because it’s easier than checking. It may actually be 12-15.) and a Sabal x ‘Birmingham’ I have high hopes for probably destined for a few more years in the pot before I try it out in the ground. (The genus Sabal includes the Palmetto Palm native to the coastal southeastern US. They tend to be slower growing than Trachys, preferring more heat, often with larger more deeply segmented fronds. For those of you who don’t know, costapalmate are intermediate between palmate and pinnate. The stem extends into the frond where the segments separate and fan out. This extension may be slight as it is in Sabal minor. Instead of having the segments radiating evenly from one point at the base, the ‘base’ is slightly elongated stretching it as if it were briefly considering being pinnate. A casual look might leave the observer thinking that something is slightly off with what appears to be a palmate leaf.) Perhaps others will be found growing in the extremes of their home ranges that can take zn7 and 8 consistently with smiles. I planted the aforementioned Trachys over the last several years in and near Waterfront Park’s bowl. (Actually, the T. princeps is new this spring. Cross your fingers.) They are consistent and durable performers…even through last winter. 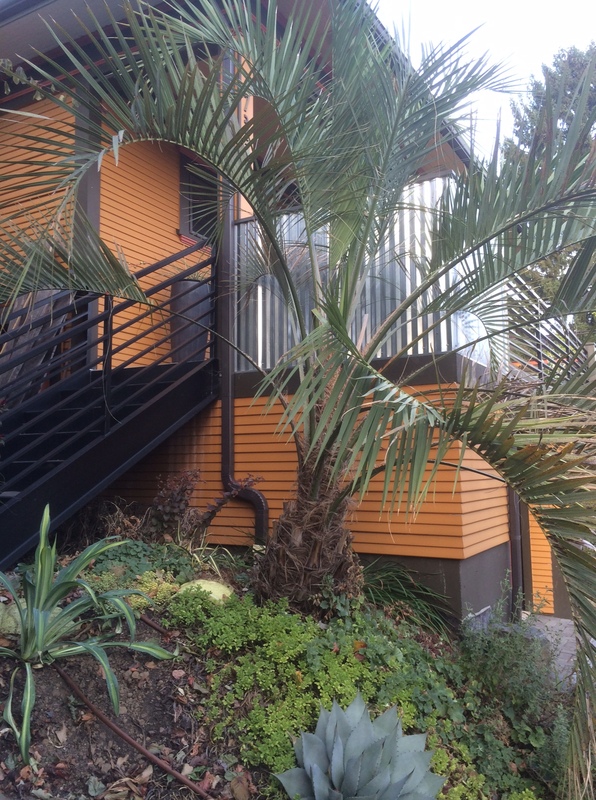 This entry was posted in Horticulture, Plant Choice, Public Gardens, Site Analysis, Uncategorized, Zonal Denial/ Tropicalisimo and tagged Butia capitata, Butia x Jubaea, Palms on September 19, 2014 by gardenriots.